Social groups are defined and separated by boundaries. Cultural sociologists define symbolic boundaries as “conceptual distinctions made by social actors…that separate people into groups and generate feelings of similarity and group membership. ” These boundaries are necessary for the existence of in-groups and out-groups. Where group boundaries are considered permeable (e.g., a group member may pass from a low status group into a high status group), individuals are more likely to engage in individual mobility strategies. Where group boundaries are considered impermeable, and where status relations are considered reasonably stable, individuals are predicted to engage in social creativity behaviors. One important factor in how symbolic boundaries function is how widely they are accepted as valid. Symbolic boundaries are a “necessary but insufficient” condition for social change. According to sociologists, it is “only when symbolic boundaries are widely agreed upon can they take on a constraining character… and become social boundaries. ” Thus, rituals and traditions to define boundaries are extremely influential in determining how groups interact. symbolic boundary: Conceptual distinctions made by social actors that separate people into groups and generate feelings of similarity and group membership. individual mobility: The ability of an individual to move from one social group to another. Social groups are defined by boundaries. Cultural sociologists define symbolic boundaries as “conceptual distinctions made by social actors…that separate people into groups and generate feelings of similarity and group membership. ” In-groups, or social groups to which an individual feels he or she belongs as a member, and out-groups, or groups with which an individual does not identify, would be impossible without symbolic boundaries. 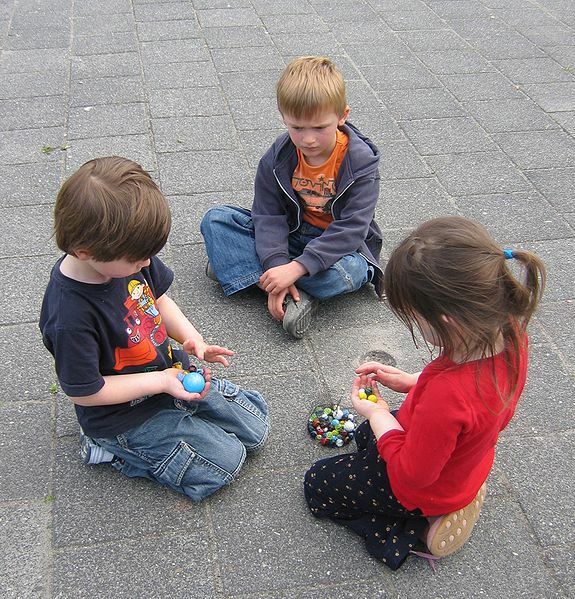 Children and Marbles: Early childhood peers engaged in parallel play. Where group boundaries are considered impermeable, and where status relations are considered reasonably stable, individuals are predicted to engage in social creativity behaviors. Here, without changing necessarily the objective resources of in the in-group or the out-group, low status in-group members are still able to increase their positive distinctiveness. This may be achieved by comparing the in-group to the out-group on some new dimension, changing the values assigned to the attributes of the group, and choosing an alternative out-group by which to compare the in-group. One important factor in how symbolic boundaries function is how widely they are accepted as valid. Symbolic boundaries are a “necessary but insufficient” condition for social change. According to sociologists, it is “only when symbolic boundaries are widely agreed upon can they take on a constraining character… and become social boundaries. ” Thus, rituals and traditions to define boundaries are extremely influential in determining how groups interact. Emile Durkheim was interested in this idea. He saw the symbolic boundary between the sacred and the profane as the most profound of all social facts, and the one from which lesser symbolic boundaries were derived. Rituals, whether secular or religious, were for Durkheim the means by which groups maintained their symbolic and moral boundaries. Mary Douglas has subsequently emphasized the role of symbolic boundaries in organizing experience, private and public, even in a secular society.